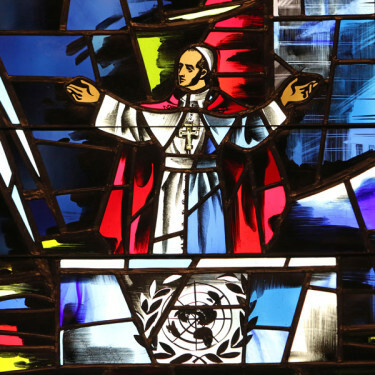 Pope Paul VI’s address to the U.N. General Assembly in New York in 1965 is commemorated in a stained-glass window at the Immaculate Conception Center, Douglaston. 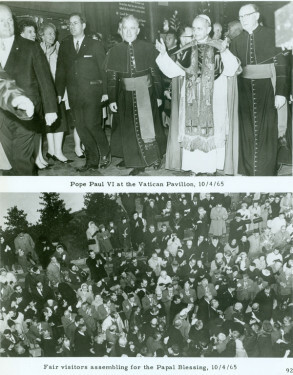 Oct. 4 will mark the 50th anniversary of the historic speech, as well as the late Holy Father’s visit to the Vatican Pavilion at the World’s Fair in Flushing Meadow. 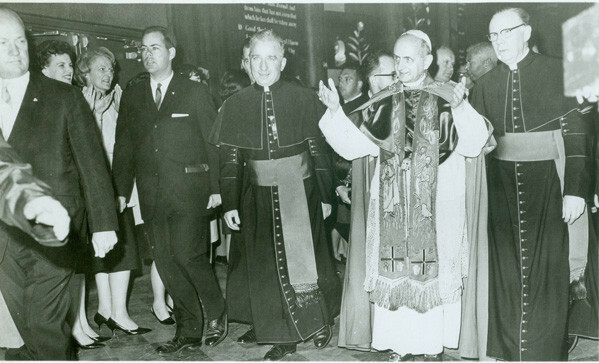 Below, Paul VI is escorted by Msgrs. Raymond Leonard, left, and John Gorman, directors of the Vatican Pavilion. Pope Francis will address the U.N. General Assembly Sept. 25.